Since the Nov. 9 election of Donald J Trump as the prospective (and now actual) president of the United States, Americans (and other nations) have puzzled over the election’s entrails. The results were virtually totally unexpected. To be sure, there were scattered outliers predicting Trump’s victory, but almost without exception the cognoscenti predicted Hillary Clinton victorious. They were embarrassingly wrong—and these are self-important types whose willingness to admit error is akin to Holocaust deniers. Thus, one conclusion, we can instantly draw, even before more than a handful of his senior officials have been confirmed, let alone implementing policy, is the fury will not lessen, and Trump’s war with the media will rage unabated. The hoary political maxim was that you don’t fight with the media—they have “barrels of ink” and the last word. Social media has reversed this truism. Trump has 20 million Twitter followers, and the media has 14 percent popularity. Undoing Obama. As president, Barak Obama proved remarkably unable to work productively with Congress. Once he lost absolute control of Congress in 2010 (after passing “Obamacare” without a single Republican vote), there was no willingness/ability to compromise by either Obama or his Republican opposition. Obama then resorted to executive orders and/or legal action to implement his desired policies in environmental protection, conservation, immigration, and civil rights for minorities, notably for LGBT persons. So we can expect a steady stream of counter-actions, reversing the Obama executive orders. Some have already been implemented. For example, reinstating the Keystone and Dakota transit pipelines demonstrated commitment to expand American jobs and energy development. Canceling support for the Trans-Pacific Partnership and expecting we will open NAFTA for renegotiation lays down the marker that Washington expects more positive outcomes from trade agreements. Other action, directed toward immigration and national security, has focused on concerns that real enemies will slither through casual immigrant/visa screening; a pause in visa issuance from questionable Islamic states is a starting point. Likewise, temporarily halting refugee admissions. More basically, Trump will address the absurdity that the USA has 11 million illegal immigrants within our borders, often enjoying services designed for citizens only. A “wall” on our southern border is symbolic but will illustrate our commitment to secure borders. More important is action to deport criminal illegals permanently; remove illegal aliens that have “burrowed in” and now seek sympathy as “Dreamers”; and penalize cities/areas claiming they are “sanctuaries” where federal law won’t apply. Robust Foreign Affairs. 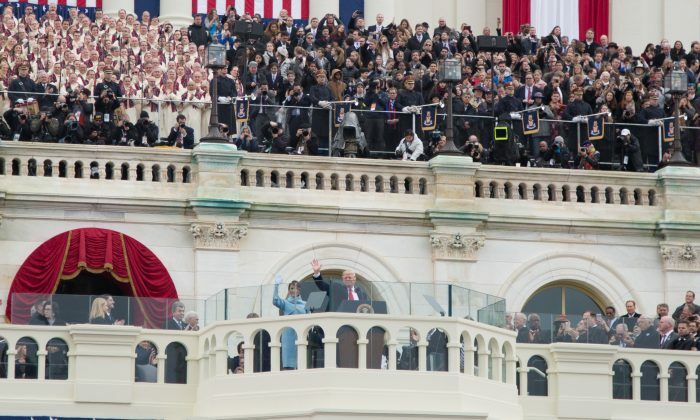 President Trump’s inaugural address was unapologetically nationalistic. Actually saying, “America First” as his lodestone was a sea change from Obama’s apology tour of the Middle East at the beginning of his presidency. Obama left the impression of a weak, faltering United States with a marshmallow foreign policy. There will be no such miscalculation when Trump addresses international issues. Nor any risible Noble Peace Prize. The most proximate, and previously fraught, relationship is with Russia/Putin. The last two administrations attempted “reset”—and failed. Now it is Trump’s turn. There are areas where tradeoffs and/or cooperation are possible: Western sanctions stemming from Moscow’s seizure of Crimea; Russia’s faltering economy; elimination of Islamic terrorism/Da’esh; stabilization/reconstruction of Syria; nuclear arms control. We can be sure Putin recognizes Trump’s axiomatic “America First,” but Trump must appreciate Putin’s corollary, “Russia First.” Finding areas of agreement will challenge both. –And NATO. Indeed, it is “obsolete.” That, however, does not mean irrelevant or unnecessary. But certainly NATO needs refurbishing. Based on European understanding they must show commitment to their independence equivalent to ours—and put money into this commitment. And they must pull more weight—refusal to support Syrian opposition forces left a vacuum for Russia/Iran/Hezbollah to exploit, resulting in Assad’s victory in the civil war. We are not playing “Robocop,” especially when Europeans have more “skin” in the game than we do. –And North Korean nukes. Pyongyang is rapidly approaching nuclear ICBM capability. Are we willing to concede a wildly unpredictable Kim Jong-un the ability to wipe out Los Angeles? But there is another wild card: Trump’s health. Never “vetted” medically, we have an overweight 70-year old male who does no serious exercise.